Ibrahim, Manar, Soliman et Eltayeb, quatre réalisateurs soudanais et amis depuis plus de 45 essaient d’influer l’amour du cinéma dans un un passé meurtri. Un de leurs derniers actions d’éclat est de ressuscité une salle de cinéma à Khartoum, la capitale. 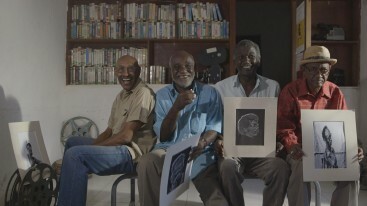 Ibrahim, Manar, Soliman and Eltayeb, four Sudanese filmmakers and close friends since more than 45 years, try to inspire the love of cinema in a wounded country. One of their last heroic acts is to resuscitate a cinema theatre in Khartoum. That is the dilemma I was presented by my Sudanese elders. The elders in question are the filmmakers who founded the Sudanese Film Group in 1968. They are now aged between 60 and 80 and journey throughout the country with a travelling cinema. They pass their knowledge on to young people and inspire the love of cinema in a ravaged land, despite only having a canvas screen that cannot withstand the desert storms. Even buying an inflatable screen becomes an epic undertaking, a new adventure to achieve one last glorious feat, their « heroic act » according to Ibrahim: to resuscitate a cinema in Khartoum, in a country where consumer society has completely outshone any cultural life. The story of The Waiting Bench is that of four filmmakers: Ibrahim, Soliman, Manar and Altayeb, all members of the Sudanese Film Group. This is the tale of their 42-year struggle to make films and the tireless hope that unites them forever. I will tell the story of struggle, passion and a gang of crafty devils with a fine sense of humour. Through their daily lives, their ambition to reopen a cinema, the memory of their disappointed dreams, what matters most to them is cinema and independence to Sudanese people.